Currently, solar energy plays just a marginal role in Brazil’s energy supply. The almost endless solar resources have no market for small scale solar systems. However, the new Net Metering regulation 482/2012, introduced by the Brazilian electricity sector regulatory body (Agência Nacional de Energia Elétrica, ANEEL), has finally opened the doors to tap a vast potential for decentralized small scale electricity generation up to 1 MW. It is a big step for Brazil´s renewable energy sector and great opportunities for German technologies in the Brazilian market. Deutsche Gesellschaft für Internationale Zusammenarbeit (GIZ) GmbH supported ANEEL to develop and implement the Net Metering regulation. Further to this, the IDEAL Institute(Instituto para o Desenvolvimento de energias alternativas na América Latina) and the Brazilian Association for Solar Photovoltaica Energy (ABSOLAR - Associação Brasileira de Energia Solar Fotovoltaica) are promoting and disseminating the use of solar PV in Brazil. In 2012, the first Brazilian photovoltaics pilot project, the solar-powered stadium Pituaçu in Bahia state was inaugurated. It was implemented by the local energy provider COELBA and supported by GIZ. This successful venture established further progress to increase the share of photovoltaic-generated electricity in the Brazilian energy system. Consequently, ANEEL introduced a Net Metering system within a new regulation for decentralized small scale electricity generators up to 1 MW. This paper assesses the profitability of decentralised electricity generation within the Brazilian housing and commercial sectors using the example of photovoltaics in the context of the introduction of the Net Metering system. The analysis is limited to the low-voltage level, since it has by far the highest retail tariffs. The article gives a review of the progress of the Brazilian Net Metering system after approximately one year since its introduction (12/2012). Trends and challenges to new grid connections as well as funding and incentivizing measures are important issues referring to this. Electricity Tariffs began to increase since the beginning of 2015 and the government announced the return to „tariff realism“, which aims at the alignment of the end consumer tariffs with the electricity production cost. This could significantly encourage decentralized PV production, as it turns small PV generation using Net Metering more profitable. In the course of football world cup 2014, the idea to utilise public´s attention in Brazil to introduce catchpenny photovoltaic projects through football was born. Shortly after, the Brazilian energy supplier COELBA supported by GIZ introduced a pilot project to build the first Brazilian solar stadium Pituaçu, with a capacity of 400 kWp. Financed by the Brazilian Energy Efficiency Program (PEE), the German-Brazilian EPC Gehrlicher Ecoluz Solar realized the installation of the system. This project led to investments of 2 Mil. Euro from the Brazilian private sector, applying 60.000 Euro of German public tax resources for the project. Reduce administrative barriers to make grid connection of decentralized renewable energy generators viable – that was one aim of ANEEL and GIZ within the German Cooperation for Sustainable Development to achieve sustainable energy use in Brazil. Within this fruitful partnership, ANEEL used its regulatory competence to reduce bureaucratization of grid connection, enabling small electricity producers by resolution 482/2012. GIZ advised ANEEL on technical and administrative aspects of the introduction of a Net Metering system and organized trainings and technical visits. In May 2014, another solar energy pilot project supported by the GIZ entered in operation: the 1 MWp photovoltaic system on the rooftop of the energy provider Eletrobras Eletrosul’s head office in Florianópolis. The project’s aim is to raise public awareness for Net Metering and Photovoltaics and to train relevant local actors in the field of decentralized power generation. GIZ thus offered technical expertise on the installation of the system as well as marketing of the produced electricity. An effective measure therefore was the commercialization of the electricity through the Solar Label, an initiative introduced by IDEAL Institute. The worldwide famous Maracanã-Stadium in Rio de Janeiro was equipped with solar panels within the efforts of linking the football world cup 2014 to the promotion of solar energy. 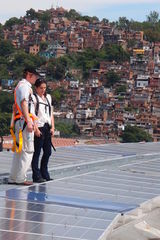 Therefore, the GIZ supported LightESCO, an Energy Service Company owned by local energy provider Light, during the conception of a PV power plant on the rooftop of Maracanã. With 390 kWp, it is the most powerful PV system in Rio de Janeiro state, and a main driver to leverage Net Metering in Brazil. The success of this project motivated Light to kickstart further PV projects in the region, also with German private sector engagement. The Brazilian island Fernando de Noronha is a nature paradise and conservancy unit – good reasons to seek for clean energy solutions in order to substitute the presently prevalent thermo-electric power generation with biodiesel generators. GIZ therefore supported the first PV pilot project on Fernando de Noronha, incentivized by the Brazilian Energy Efficiency Program (PEE) and executed by the energy provider CELPE with an investment sum of five Mio. BRL (approx. 1.7 Mio. EUR). The PV power plant Fernando de Noronha I, which has an installed capacity of 400 kWp, can already cover four percent of the islands´ electricity demand; its successful implementation led to the construction of a second PV power plant on the sunny island. Fernando de Noronha II, with a capacity of 550 kWp was inaugurated in July 2015. The Solar Fund was created by the NGO Ideal Institute, GIZ and Grüner Strom Label e.V. (Green Electricity Label - GSL), a German association that promotes the use of green energy in Germany. The aim of the Solar Fund is to support the dissemination of Net Metering and distributed generation in Brazil by s giving financial and technical support for end users. The Solar Fund identified barriers for the installation of a residential PV system which are used to improve the Net Metering regulation. The Brazilian Solar Energy Atlas includes maps and digital data of various solar radiation components as well as detailed infrastructure and socio-economic parameters. The resulting database is compatible with the Geographical Information Systems (GIS) and therefore may be easily employed in feasibility studies during renewable energy project development. After analysing the temporal and spatial variations and trends of solar energy resources, the atlas presents some solar energy scenarios for Brazil. In Brazil, electricity must be traded in one of two environments of the market, the Regulated Contracting Environment – ACR and the Free Contracting Environment – ACL. This report describes the main characteristics of the two market environments, with the purpose of assessing the possibility of implementing distributed power generation in Brazil through photovoltaic projects. It also indicates the states that are already offering tariff parity. Another conclusion is that in the Brazilian scenario, the metering system in the net-metering mode is more feasible than the feed-in tariff model. The main objective of this study is to inform about the current regulations, standards, as well as control and measurement methods of reactive power and power factor applied in Europe. Furthermore, it describes interrelated challenges of and opportunities for the integration of new consumer groups and decentralized renewable energy based power generation. This article gives an overview on the renewable energy support policies - Feed-in tariffs and Net Metering - analyzing their legal framework in Germany. It subsequently develops perspectives for Net Metering in Brazil. Further attention is paid on the impact of decentralized generation on load curves and distribution infrastructure. To help ANEEL developing the legal procedures for decentralized distributed generation, this study addresses the legislation in Germany and Italy as reference countries with sharp increase of decentralized power generation plants up to 1 MW, in particular from renewable energies, in the recent years. It gives an overview of the relevant energy law provisions and, in this context, existing contracts between energy operators and grid operators for the interconnection of small distributed power generation plants. Legal-administrative barriers for the connection of small distributed generators led in the past to negative impacts on the implementation of decentralized generation in terms of longer project durations, higher costs, longer waiting times and more demanding labor requirements. The comparison and assessment of different international technical standards for interconnecting of small distributed generation units to the public grid in the European countries (Germany, Italy and Spain) and the United States of America, thus, allows to derive recommendations for a simplified connection procedure in coherence with Net Metering in Brazil. The former status quo of the proceedings in costumer-generation projects before the introduction of Net Metering in Brazil did not allow the injection of electricity from distributed generation in the grid. Hence, the missing regulatory incorporation of distributed generation respective costumer generation is the fundamental barrier for its diffusion. To achieve the simplification of the connection procedure for costumer-generation, interconnection barriers resulting from regulatory obstacles in Brazil are identified as well as an overview to the development of PV in Brazil and the regulatory framework, rules and proceedings for interconnection of distributed generation is given.The aim is to enable interconnect despite the interconnection barriers and develop attempts on the introduction of incentive schemes within the legal framework. In Germany, lately some developments with respect to renewable power generation and its connection to the different voltage levels occurred. Due to the enormous increase of such installations and the fact that renewable power generation units so far have been considered more or less as “negative loads”, but without consideration of their capabilities to act in the same way as conventional power plants, certain problems arose. This report identifies these problems and discusses the policy measures to address them. To get to know the behaviour of consumer groups is important for the process of tariff revision or the calculation of marginal costs calculation and the basis tariff related to distributed generation. Therefore, it is important to understand the methodology used to calculate the yearly average electricity consumption of the Brazilian consumer group B3 (commercial and small industry). To amplify the use of small scale energy generators, this study develops a methodology to estimate and map the potential of residential housing rooftops for electricity and heat generation produced by photovoltaic panels and solar collectors. The methodology regards aspects of the country-specific sun irradiation, total rooftop area and areas improper for use. This training manual shows how to use the geographical information system GIS in order to map the potential of residential rooftops for electricity and heat generation. It gives instructions over the general use of GIS and the mapping software ArcGIS. Subsequently, the manual describes the use of ArcGIS to identify sun irradiation potentials. 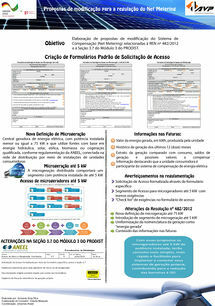 The resolution 482/2012 adopted by ANEEL is the regulatory base for Net Metering for distributed generation in Brazil. GIZ supports the IDEAL Institute to promote and disseminate renewable energy use. Important progress could be achieved through the project America do Sol, which offers information, educational material and online tools on solar energy, photovoltaics and Net Metering. This Manual explains in a simplified and illustrated manner all steps to connect a mini or micro generator. It shows how to calculate the financial benefits of distributed solar generation to its user and describes how to request grid connecting at the distribution company. The Ideal Institute officially launched an educational manual on Solar Electricity. It aims to inform institutions, schools, media, business and public utility suppliers on the use of small decentralized photovoltaic systems. The manual can be sent to the institutions and can be reprinted and distributed by the institutions themselves to their customers. This Partnership of the Ideal Institute with the Grüner Strom Label fosters distributed power micro-generation in Brazil through financial support available to home consumers and small businesses for the installation of photovoltaic generators with a capacity of up to 5 kW. This presentation gives an overview to the approach, activities and first results of the solar fund in Brazil. Further to that, it explains how the fund model of the Green Electricity Label (Grüner Strom Label e.V.) works. The Solar Label is awarded to companies or public and private institutions that consume a minimum annual value of solar electricity, which varies according to the total amount of energy consumed. This report registers the process of establishment of the Selo Solar as instrument for providing the use of solar electricity. It describes the conception and implementation as well as regularization of Selo Solar and points out some challenges in its application. The Solar Simulator is an online tool that allows to calculate the power of a photovoltaic system (solar electricity generator) required to meet the annual power demand of a residential house, a commercial or industrial building within the brazilian Net Metering. The tool calculates how much electricity the property would save as well as the total area required on the rooftop or ground area to install the solar panels. Step by step to your own wind power system – that’s what the educational manual launched by IDEAL Institute describes. It gives an overview on basic technical aspects, project planning and implementation and profitability of small scale wind power systems, including the utilization of financial compensation through Net Metering. The objective is to encourage consumers to install small scale wind power systems. This presentation gives an overview to the activities of the IDEAL Institute, including projects, studies and communication materials offered by IDEAL Institute. The Rooftops Project 50 was launched in order to promote distributed generation based on photovoltaic power. Coordinated by Ideal Institute, the project is run locally by installation companies that, by December 2015, should achieve the goal of installing 50 photovoltaic roofs of 2 kWp (or 100 kWp total installed power). The center for research and training in solar energy of the UFSC was inaugurated in July 2015. It disposes about different PV technologies, administration, classrooms, laboratories and workshops; it also includes a small PV system with an installed capacity of 100 kWp on its rooftop. The initiative addresses the huge demand on capacity building measures in the Brazilian PV sector. Uncertainty about the cost-effectiveness of a small scale photovoltaic installations in Brazil is one mayor reason for the hesitant interest in distributed generation. This uncertainty is related to an unknown composition of Brazilian electricity tariffs. The study analyses the Brazilian tariff system of the electricity sector in the low voltage consumers segment, specifically consumer groups B1 (residential) and B3 (commercial and small industry). The analysis aims to build a basis for rentability studies of PV installations. The allocation of information about taxing for the import and export of components for small scale photovoltaic generation is crucial for the sucess of distributed genertation in Brazil. An overview on tax conditions, therefore, facilitates the entrance of foreign technology producers in the Brazilian market. Important information considering PV business consists of fiscal benefits granted by states and other public initiatives and costs for logistics and certification of components. This thesis assesses the profitability of decentralised electricity generation in the Brazilian commercial sector. It aims to prove if net parity is achieved in relation to the introduction of Net Metering. Therefore, it analyses the electricity supply situation in the commercial sector, the characteristics and macro-economic influence factors of PV in Brazil. Subsequently, the author develops scenarios in which this work concludes whether profitability is given or not. The obligatory installation of the readily accessible disconnection device (port.Dispositivo de Seccionamento Visível - DSV), a component that visibly guarantees the disconnection of small generation centrals during distribution system maintenance of the provider, is one of the elements required by the PRODIST (port. Procedimentos de Distribuição de Energia Elétrica no Sistema Elétrico Nacional) Module of Resolution 482. This component is not used any longer by countries with a large percentage of photovoltaics like Germany and Italy. 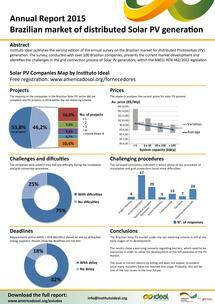 The study analyses if the legal requirement of DSV in Brazil is a barrier on the development of small PV generation. In Brazil, one part of the electricty bill of residential consumers is the so called Availability Cost of the Electricity Sector (port. Custo de Disponibilidade do Sistema Elétrico). It is the minimum value charged by the electricity distributer, independently of any electricity consume. The Custo de Disponibilidade is considered as one item that may contribute to doubts about the profitability of small decentralized generation. This article points out the legal basis of the Custo de Disponibilidade, highlighting how ANEEL could use its competencies to alter the regulation in a favourable manner for small distributed generation. The purpose of this study is the presentation and comparison of international standards for interconnecting small distributed generation units to the public grid of different European countries (Germany, Italy, Portugal and Spain) and the United States of America. Recommendations are derived for a simplified connection procedure especially in secondary grid networks or spot networks in coherence with Net Metering. ANEEL, supported by GIZ, started efforts to improve the net metering regulation (RN 482/2012). This GIZ study makes proposals for the revision of the regulation concerning, for example, standardization / harmonization of application forms and documents and billing of electricity generation. Solar Fund also made a contribution to improve the Net Metering regulation. Proposals aimed at the harmonization of the installed components of a system required by the electricity providers, facilitated measurement procedures and improvement of the inspection of the system executed by the providers. IDEAL Institute, supported by the GIZ, established a dialogue channel with Brazilian photovoltaic installation companies via its Solar Company Register. These contacts were used to support the elaboration of a market study on the relationship between installation companies and energy suppliers. Therefore, since 2014, IDEAL Institute has applied a methodology based on an online survey. The questions refer to general market relevant information about grid connection and installation costs, as well as companies´ familiarity with the legal framework and connection procedures adopted by energy suppliers for Net Metering and distributed generation. This report is carried out annually and presents inquiries about the market development of PV. As of 2016, the Annual Report is produced in partnership with AHK-RJ and in 2017 the Brazilian Regulator Agency (ANEEL) also became an institutional supporter. Assisted by accountants and lawyers, GIZ Brazil developed a Business Model for Brazilian Net Metering based on private investments. The business model is designed for renewable energy entrepreneurs and consists in attracting investors to purchase equipments for distributed power generation in order to rent them to third parties. Brazil has a strong tradition of cooperatives, with currently more than 6,600 cooperatives and more than 13 million associates. This provides a great opportunity for distributed renewable energy generation. Recently, the national electricity regulator ANEEL introduced a norm that allows the net-metering scheme to be used not only by households but also by cooperatives and condominiums. The BMZ funded projected “Energy Systems of the Future”, implemented by GIZ in cooperation with the Brazilian Ministry of Mines and Energy (MME), has supported the development of a booklet that provides guidance on that new business model for renewable energy generation. The booklet explains the basic aspects of a renewable energy cooperative and provides orientation on the legal structure and financial viability. The booklet was officially launched by the Brazilian Cooperatives Organization (OCB) on May 2018 in Brazil with the participation of more than 50 regional OCB representatives who will further disseminate the information along with support activities to foster capacity building and implement first pilots. The German experience with the business model of renewable energy cooperatives has strongly been utilized within a close collaboration with the German Cooperative and Raiffeisen Confederation (Deutscher Genossenschafts- und Raiffeisenverband, DGRV). It was part of the scope of action as well the development of individual and institutional capacities. So, almost 800 people participated in 12 regional workshops about this business model and photovoltaic solar energy, of which about 10% were members of the technical staff of OCB´s regional units (80). Also, the new business model was presented at 18 renewable energy events in different regions of Brazil along 2017 and 2018. An online simulator was developed by Ideal Institute and Photovoltaic Group of the Federal University of Santa Catarina (UFSC) based on the parameters designed in the guide and integrates the main knowledge platform on photovoltaic energy in Brazil - Programa América do Sol. 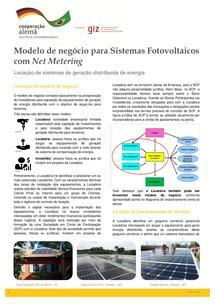 Folha informativa Modelo de Negocios para SFV com Net Metering (2015): An overview of the Business Model for the Brazilian Net Metering is presented on this 02 pages factsheet. The Business Model for the Brazilian Net Metering was presented at Rio 15 International Climate & Energy Event in 4th of September 2015 and at Seminário Internacional de Energia Fotovoltaica - Aplicações em Telhados Industriais in 4th of November 2015. The presentations available here can complement the understanding of the business model. Enterprise’s Establishment Contract - Modelo de Contrato Social para Sócio Ostensivo (2015): Aimed to renewable energy entrepreneurs, this document is a recommended and editable model for establishing the company responsible for attracting investors and for the lease of the equipment of distributed generation to third parties. Contract Model for Account Participation Society (SCP) and Investors Admission Term - Modelo de Contrato para a Sociedade em Conta de Participação (SCP) e Termo de Admissão (2015): Also aimed to renewable energy entrepreneurs, this document is a recommended and editable model for setting up an Account Participation Society (SCP). This kind of society allows people and companies to invest in projects from the Lessor without becoming shareholders of the Company, because SCP does not acquire legal personality. Lease Agreement Model for PV System - Modelo de Contrato de Locação de SFV (2015): A recommended model of Lease Agreement is presented here to renewable energy entrepreneurs. This document addresses a comprehensive list of issues that could be faced by Lessor and Lessee. The model can be edited and complemented according to the details and requirements of each PV project or enterprise. This study gives information about the Brazilian solar stadiums planned for the football world cup 2014 to defend the projects in terms of profitability and their significance as marketing instrument to stimulate the increase of distributed PV generation in the country. The characteristics of each of the new stadiums are given and the possible PV cover area is calculated. In the World Cup 2014, four stadiums were equipped with FV power plants. To execute the installation of PV modules on the first Brazilian solar stadium Pituaçu, this study identifies and presents five German PV companies. As preparation of the executive project, technical and arquitectural data about Pituaçu stadium like construction plans and information about engineering of the stadium as well as about the company COELBA as executing energy provider has been gathered and analyzed. Based on that information and the financial offers, a detailed evaluation of the companies applying for the projects technical execution was done. The biggest public bank of Latin America, the Brazilian CAIXA, equipped its agency in Vazante, Minas Gerais state, with a PV power plant, making it Brazil´s first electricity supply self-sufficient commercial building. The surplus electricity produced at Vazante agency is fed in to the local grid through Net Metering. By this means, the agency will save 51.000 BRL per year (more or less 17.000 EUR). GIZ supported CAIXA during the implementation of the project, whose success led to CAIXA´s intention to transform further commercial buildings into sustainable “Zero Energy” bank agencies. ↑ Ideal Institute, created in 2007, is a private nonprofit based in Florianopolis, State of Santa Catarina, Brazil. Ideal Institute is an institution that promotes renewable energy and the development of policies for energy integration in Latin America. Ideal conducts three major areas of expertise: the Eco_Lógicas Contest, the Cleaner Energy Seminar, and América do Sol. They all include a number of initiatives free of charge. ↑ Founded in 2013,ABSOLAR - Associação Brasileira de Energia Solar Fotovoltaica(Brazilian Association for Solar Photovoltaica Energy) the Brazilian Association of Solar Energy Photovoltaic (ABSOLAR) is a legal entity of private non-profit organization that brings together companies from the entire production chain of the photovoltaic industry (PV) with operations in Brazil. The ABSOLAR coordinates, represents and defends the interests of its members in the development of the sector and the solar PV market in Brazil, promoting and disseminating the use of solar PV in the country. This page was last modified on 19 March 2019, at 20:40. This page has been accessed 303,273 times.